This post is sponsored by BabbleBoxx.com on behalf of Single Edition Media. All thoughts are my own. Fall is my favorite season, hands-down! Not only do I get to celebrate my birthday in the fall, but the weather turns perfect (not too cold, not too hot, and no humidity or blossoms causing allergies!). And the FOOD of the fall is some of my favorite of the whole year. I was excited to get a BabbleBoxx full of amazing products perfect for the fall, and I can’t wait to share them with you. How fun does this #BabbleBoxxFall Home and Harvest collection look? I LOVE pumpkin spice, and I love how it tastes so good in so many different recipes. Well, let me tell you….peanut butter and pumpkin spice is the perfect combination! Peanut Butter & Co. has taken its award-winning smooth peanut butter and blended it with real pumpkin and yummy pumpkin pie spices like cinnamon and nutmeg to create its limited edition seasonal peanut butter. Use it on apples as a dip or spread, in sandwiches, in recipes, or even straight out of the jar. Grab some delicious recipes using this pumpkin spice peanut butter (including Peanut Butter Pumpkin Spice Latte and Pumpkin Spice Peanut Butter Cheesecake) HERE. PS – Like all Peanut Butter & Co. peanut butter, Pumpkin Spice peanut butter is made exclusively with USA- grown, Non-GMO peanuts and contains no cholesterol, no trans-fats, no hydrogenated oils, and is dairy-free and soy-free. Print your $1 in store coupon to use on Pumpkin Spice peanut butter and any other 16oz jar flavor HERE! I love to cook, but I don’t always have a lot of TIME to cook….or figure out WHAT to cook. I received some Dinner Mixers to try and my mouth was watering with the options! Dinner Mixers by Tastefully Simple are a meal starter kit that includes a main dish recipe and a side dish recipe plus the pre-measured Tastefully Simple products needed to prepare both recipes. You are able to add your own fresh ingredients (allowing you to have total control over the quality of the fresh ingredients and providing the opportunity to buy local). You add the fresh and we add the flavor while helping you decide what’s for dinner! You can customize your Dinner Mixers order based on your family’s preferences. I think my favorite part is that their recipes use common ingredients that I typically have in my pantry or fridge already, and all I have to do is grab the recipe and the spices and I’ve got dinner figured out. As a woman who loves to cook, I’m all about getting the right tools to make food prep easier. The right tool can make all the difference! We eat a lot of cauliflower and brussels sprouts at home (although I was totally out of cauliflower when I took the above picture. Oops!) so these two kitchen tools are perfect for our kitchen. Twist’n Sprout: Prep sprouts in a snap with this compact tool – simply press Brussels sprouts onto the tip of the tool and twist to remove core for a more evenly cooked vegetable. StalkChop: Our powerfully simple cauliflower tool makes wrangling this tough vegetable surprisingly quick and easy and safely takes the hard work out of separating florets from stalk so that cauliflower and broccoli can go from vegetable drawer to dinner plate in a flash. I might not have little ones any more, but that doesn’t mean we don’t get messy! As a family that doesn’t need diaper wipes any more, having Wet Ones® hand wipes is ideal for us. Because sometimes you don’t have a sink and soap when you encounter a mess! About Wet Ones® Antibacterial Hand Wipes: Wet Ones are the convenient 2-in-1 way to wipe out dirt and messes and kill 99.99% of germs when soap and water aren’t readily available. Theyclean better than hand sanitizer gels, wiping away dirt and messes without drying out skin. They are hypoallergenic and contain aloe and lanolin, making them easy on skin for even the littlest of hands. Wet Ones® Hand Wipes are available at mass, drug and grocery stores nationwide and come in three convenient sizes so you can keep them at home, in the car, and in purses and backpacks. 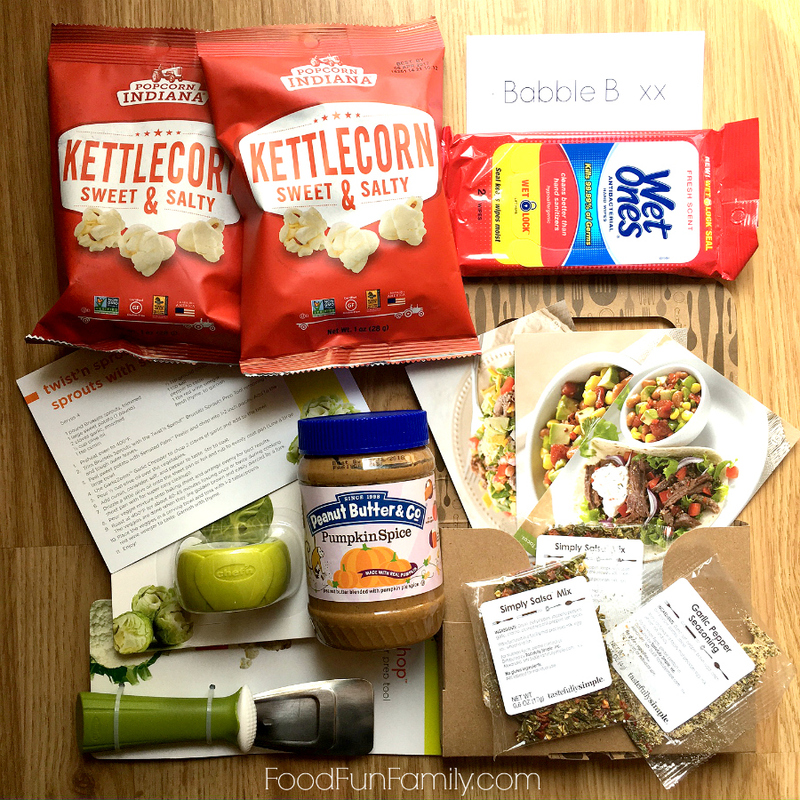 I’m not sure how BabbleBoxx knew that Kettlecorn is our FAVORITE treat. These bags of sweet and salty popcorn did not last long! They were SO delicious! About Popcorn, Indiana: Popcorn, Indiana is a real place. It’s a small town, in the heart of corn country. Population 42. And yet, somehow it’s more than just a town. It’s a time, a philosophy, a way of life. Honest, just like the popcorn that bears its name. Popcorn, Indiana – tender pieces of joy made for you and your family. The maker of America’s #1 Kettlecorn, offers a broad range of adventurous flavors for any palate. In addition to our sweet & salty Kettlecorn we offer: Sea Salt, Aged White Cheddar, Movie Theater, Chicago Style Caramel & Cheese and Smoky Queso. For those looking for a bit of indulgence we have a range of decadent Drizzlecorn® flavors including Black & White, Dark Fudge Sea Salt Caramel, Dark Fudge Pretzel & Dark Fudge Peppermint. All Popcorn, Indiana products are certified gluten-free by the GFCO, are made from non-GMO corn and contain whole grains. Popcorn, Indiana snacks are available at national, regional and local retailers across the U.S. and Canada. What products from the BabbleBoxx Fall collection are you most excited to try? I would love to try the Pumpkin Spice peanut butter! I bet the flavor tastes amazing! I haven’t tried Peanut Butter and Co products but but I’m always fascinated by the flavors they come up with. Pumpkin spice peanut butter?? I had no idea such a thing existed. I gotta look for that!